The landscape may have changed for the Sacred Heart basketball team this year, but the goal and the approach most certainly have not. Whether it’s 1A, 2A or the NBA, the mindset of the Cardinals has always been to dominate the opposition and reach for the highest prize attainable. After dominating Class 1A the last four years, the Cardinals now are making their way against a new collection of teams in 2A, the victim of their own success, and for the time being it’s that state championship blue trophy they pursue. They crossed the first speed bump on that road Saturday night, beating Westbrook Christian 61-42 for another area title, this time in 2A Area 11. The Cardinals (18-10) will now host Area 9 runner-up Ranburne (15-12) in Tuesday’s sub-regional round with a berth in the Northeast Regional at Jacksonville State in the balance. Westbrook (17-14), meanwhile, will travel to Area 9 champion LaFayette (26-4) in hopes of keeping its season alive. Sacred Heart forward Khalil Watkins was named tournament MVP for the second year in a row. 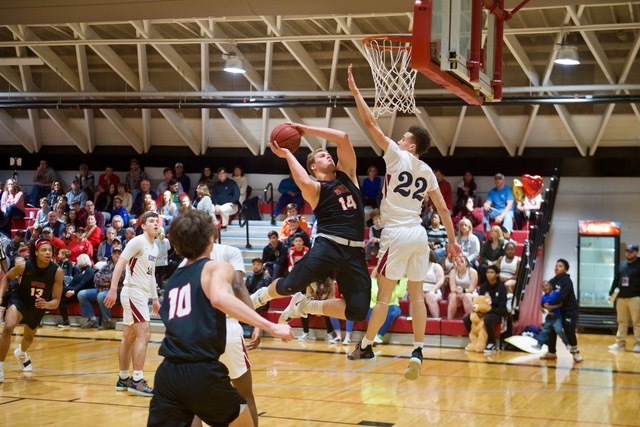 He had a monster performance in the Cardinals’ opening-round rout of Gaston – 30 points, 12 rebounds, six assists – and although his numbers may not have been worthy Saturday night he held the team together against the Warriors despite early foul trouble. Sacred Heart’s Jayden Stone was the MVP of the county tournament. He was clearly the best player all week, but his team lost in the championship game to Oxford. 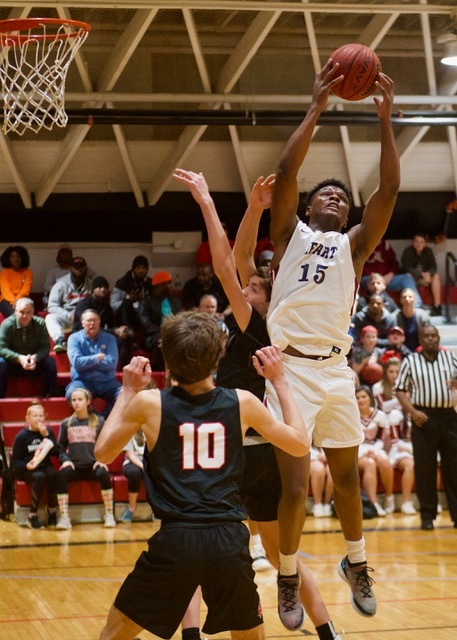 Watkins was particularly aggressive at the front of the press at the start of the second half, without the fouls that handcuffed him in the first. The Cardinals had a 30-25 halftime lead, but they came in the third quarter and created three quick baskets off the press to start a rapid-fire 12-2 run that gave them complete control of the game. While Watkins was creating the turnovers, Caleb Brown was finishing them off. Brown scored the first baskets of each half and the first two baskets of the third quarter. He finished with 15 points. Stone was the Cardinals’ leading scorer with 18 points. Brown and Stone joined Watkins on the all-tournament team. The Warriors closed the gap to 12 at the end of the third quarter, but the fourth was a show of the Cardinals’ quickness and athleticism and they steadily pulled away. WESTBROOK CHRISTIAN (17-14) – Andrew Lockridge 1 2-3 5, Joe Pirani 0 0-0 0, Grant Martin 0 0-0 0, Brandon Foster 0 0-0 0, Joseph Gilcrest 3 2-2 9, Jonah Morris 3 3-4 10, Bryce Wood 0 0-0 0, P.J. Wells 0 3-4 3, Jackson Luttrell 3 0-0 6, Cade Phillips 1 6-8 8, Ryan Scott 1 0-0 2, Christian Morris 0 0-0 0, Caiden Wright Wyatt 0 0-0 0. Totals 12 16-21 42. SACRED HEART (18-10) – Spencer Wigley 0 0-0 0, Khalil Watkins 4 1-2 9, Jack Miller 1 1-2 3, Allen Marshall 2 0-0 4, Caleb Brown 7 0-0 15, Javen Croft 0 0-0 0, Anthony Bothwell 0 0-0 0, K.D. Harris 0 0-0 0, Aaron Moore 4 0-0 8, Jayden Stone 7 3-7 18, Cade Landers 2 0-0 4, Devin Barksdale 0 0-0 0, Ray Simmons 0 0-0 0. Totals 27 5-11 61. 3-point goals: Westbrook 2 (Gilcrest, Morris); Sacred Heart 2 (Brown, Stone). Technical fouls: Westbrook coach Dickey. Total fouls: Westbrook 16, Sacred Heart 22. Officials: Wood, Walker, Ingram.